It's a familiar story, as old as time almost, that behind every masterpiece there is an unsung hero. It may be in the guise of a benevolent patron with an eye for spotting talent or as family and friends providing succour to the struggling artist. At least that's how these things are often portrayed in history books and screenplays. The reality is often quite different and nowhere near as romantic, as the unsung hero will usually turn out to be a talented craftsperson who is able to interpret the mind and drawings of a conceptual designer to produce work that would otherwise never see the light of day. Philanthropy and furniture making go hand-in-hand and throughout history the more notable workshops, such as Chippendale, Gillows and even Alan Peters have relied on skilled craftsman in order to run a successful business. Designers don’t always make good makers, however, and the best makers are often far too disciplined or practical to be a designer. In this first of a series of new articles, Furniture&Cabinetmaking is going to burst through the 'staff only' door into no-man's land to meet the talented makers producing work that carries someone else's name. 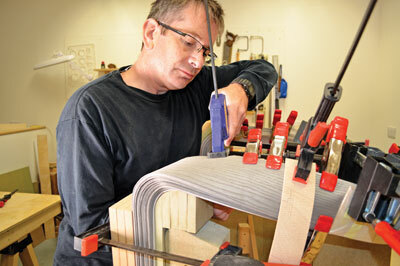 Our first 'unsung hero' is Tim Smith, master craftsman and head maker at Waters&Acland. He can now consider his anonymity gone! Tim, how did you get into making furniture? 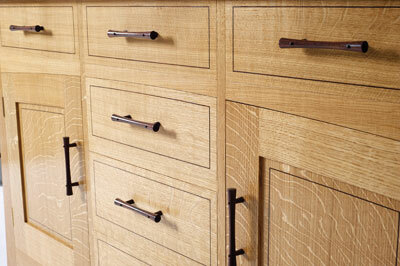 I started out working for a company that made and restored furniture alongside larger joinery-based projects. I quickly realised I enjoyed the furniture-making side more, so in the late 1980s I set up my own workshop to make bespoke pieces. Seven years later I moved to a well-respected furniture maker, where I stayed for 19 years and since 2013 I have been a maker at Waters&Acland. Do you work with any materials apart from timber? 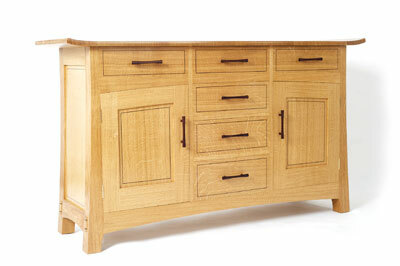 We do work mostly in solid timber and some pieces are veneered if movement would be an issue. The seat and back for Waters&Acland's 14-12 Chair and F&C issue 238 - in are made from fibreglass, padded and leather covered. You're obviously comfortable making pieces that have been designed by someone else. Do you ever feel that it is depriving you of your own creativity? My creativity comes from transforming a pencil sketch or a drawing on a piece of A3 to the finished form. What's the piece you would most like to have made? I've made writing desks of various designs in the past. But I think something bigger and more ornate, such as a secretaire or an escritoire with lots going on like secrets and clever mechanisms, would be fun. Would you say you are more reliant on hand tools or machine tools? I'm happy using both. The balance between machine use and handwork can vary greatly between jobs. Chairs, for example, usually require a large amount of machining, as high as 70%. 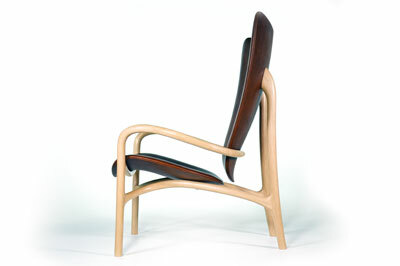 This chair - the 14-12 - however, is the other way, perhaps only 20% machining and the rest by hand. As the senior maker at Waters&Acland, how comfortable are you at being a mentor for impressionable young minds? Before working at W&A I headed up a workshop with some six or seven makers. We always had at least one apprentice, so I'm comfortable with the many aspects of training and mentoring young people. 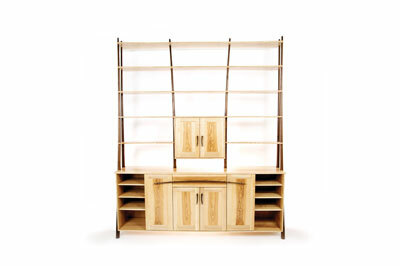 After moving to W&A it soon became obvious that there was a huge difference between learning cabinet making in a commercial environment to that of a furniture school. An enthusiastic apprentice will make good progress but still be constrained to a degree by the very nature of learning while working on a costed job. Someone in the furniture school, on the other hand, has a much more intense learning experience. They can practise a technique until they get it right before moving on to something else. And with the dedicated time of a highly skilled trainer they can be making pieces to a very high standard in half the time. What's the tool you can’t do without? If we're talking recently, then the tool that's never far away is a wonderful Auriou cabinet maker's rasp – grain 10. It's not actually mine, but just one of a great variety of new, best-quality tools available for the students in the furniture school to try, so they can get an idea of what tools they will need and get a feel for them before buying their own. The rasp cuts really quickly, but without tearing, great for following on from the arbortech. Generally, though, a favourite tool of mine is a Moseley&Son’s mitre plane which I love. I was given to me by an uncle who shared a love of woodworking. Even if it's just sitting on the bench it looks good and in use as a low-angle, bevel-up smoother it leaves an amazing finish. With something as experimental as the 14-12 Chair, how do you go about planning your workflow for the project? This was one of those jobs that had a natural progression. 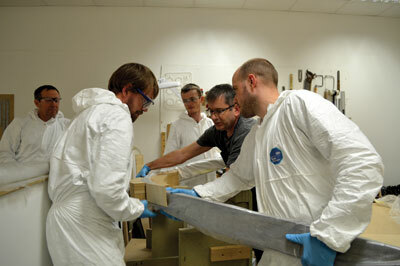 First off, the formers were made to shape the fibreglass seat and back. Next, I wanted to mock up a framework to hold the seat and back in their respective positions according to the drawing, so designer Will Acland could check the ergonomics and their relationship to each other within the frame. Once that process was complete I had built up a clear idea of how the rest of the chair would be made. 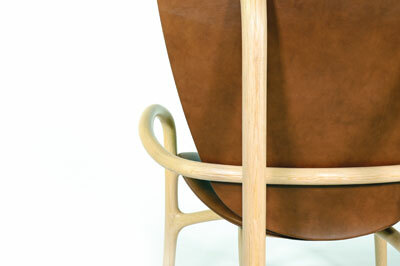 The chair progressed with a cycle of jig making, laminating, jointing and sculpting. As with any job some careful planning has to happen to ensure an efficient workflow. Was there ever a point when you thought it might not work? I don't think I doubted it would work. It was always going to be a challenge, but once I'd worked out the geometry and the relevant jointing points, things moved along well. When you are making something as unique as the 14-12 Chair, do you ever stop to think how it might be received in, say, 50 or 100 years' time? That's a very interesting question. If you look back over the past 50 or 100 years you would see that things haven't changed that much in terms of technique. Now, though, there seems to be great changes happening in the way things can be made using new machinery. When I first heard about 3D printers, for example, and what they would be capable of I was blown away and couldn't quite believe it. Who knows what a maker will be using in 100 years' time, but I would hope that they would still have an appreciation of the handwork that had gone into this chair. As F&C understands it there are more 14-12s in the pipeline. How do you feel about that? The first two chairs are now finished and delivered. Chair number three is well under way. With all the jigs and former made, the job now takes on a different feel. It has moved from the challenge of a new epic project to the now familiar job that can be moved along at a pace and enjoyed because of that familiarity. Do you think that part of the chair's appeal is that it has overcome some extremely challenging feats of engineering and construction in wood or do you think people warm to the overall shape and visual experience? I would hope both, but I realise that a maker will have more of an appreciation of the methods involved in the process whereas someone without that knowledge would enjoy the chair's aesthetics. Do you think it would it have the same appeal if it had been made on a 3D printer? The idea of that scares me a little bit. If it could be done I would imagine that it would be a poor, soulless imitation. Can you see yourself investigating new methods of technology to make furniture? Yes, of course! But only if that technology was an aid to the furniture maker's skill, not a replacement. You must have a favourite designer, but is there also a maker that has had a significant influence on your work? As we're talking chairs, then my favourite designers would be Charles and Ray Eames. The Eames 670 or lounge chair has been one of my favourite pieces of furniture for years. A more recent designer who has influenced me would be Will Acland. My appreciation of many of his wonderful designs helped make my decision to come and work for the company and I haven't looked back.